The brand new building for Lesley Shand funeral directors in Corfe Mullen is now taking shape with the roof in place. The business, which has been helping the bereaved for more than two decades, is part of Douch Family Funeral Directors that has more than 100 years’ experience. Its previous building in Wareham Road was demolished and a new, state-of-the-art facility is now going up in its place and will be open early in 2018. The business – which has recently been nominated for a major national award – is continuing to operate from premises across the road. 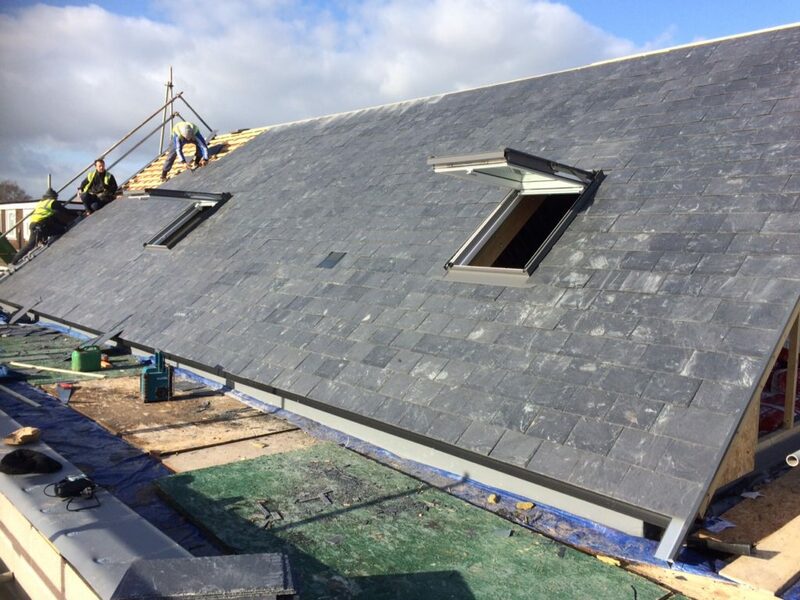 The roof is to be covered in grey slate tiles, the windows have been installed and currently the floors are being laid after which the stud walls can be inserted. When completed, it will provide larger and better offices for the staff, more space for clients and will have better access. Included will be a service chapel that will enable families to have affordable funerals in a purposely designed room. A local independent furniture company will be helping to create an interior that is in keeping with the special requirements needed. Lesley Shand opened the funeral directors in Corfe Mullen in 1990 and it later became part of the Douch family group, which has eight branches.